Collecting Antique Glass offers one of the widest opportunities for the antiques collector. When collecting antique glass you are collecting some of the most delicate, most beautiful and most precious items that man has ever produced. Nothing has been developed that can replace it and the manufacturer of glass is becoming much more technically advanced. We are finding far more uses for it. The actual manufacturer of glass began in the Middle East more than 3,500 years ago, with the earliest known production of glass recorded in the UK around 1226. The wealth and breadth of glass available to collectors is staggering and new collectors should try to concentrate on a specific period or style of glass. Basically glass consists of sand with the addition of an alkaline flux to help it melt at a lower temperature and a stabiliser, usually lime, as glass tends to be quite unstable so over time all glass will break down and crumble. How long this takes depends on how well the glass is made and what went into it, in what proportions. Generally glass has a greenish tint, due to the presence of iron in the sand, so neutralisation is usually accomplished by the addition of its spectrally opposing colour achieved with manganese. Of course some glass is meant to have colour and this is given by adding various metallic oxides such as copper, cobalt, gold etc. In early times these were probably impurities in the sand and glass makers learned how to use them for decorative effect. Over the centuries people have tried to improve the clarity and brightness of glass and this has been achieved by adding lead oxide as a flux. George Ravenscroft is usually attributed with this discovery in the late seventeenth century but lead oxide was already being used in Italy in the production of paste jewellery and it is more likely that he had found out this fact and put it to use here and in doing so put Britain to the forefront in the production of glass vessels during the eighteenth century. Glass is worked in a molten form requiring constant reheating to keep it plastic. It is shaped usually by being free-blown through a rod and then manipulated into the desired shape or blown into a mould a technique used in Ireland and America in the late eighteenth and early nineteenth centuries though this method had been invented in about 25 B.C. In this way decoration can be produced quickly and easily. Once the piece has been made it then has to be annealed i.e. cooled very slowly so that any stresses can be reduced that might build up causing it to shatter. Even so glass still has stresses within it with handles being particularly prone to damage. 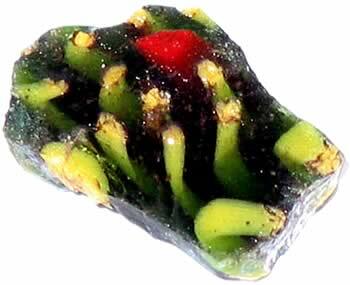 The exact origins of the process of glass making are unsure but it is thought that it first appeared in Mesopotamia about 3000 years B.C. probably as a result of experimenting with glazes for pottery. At first glass was used as an alternative to precious stones as it could be coloured and cut. Glass reached Egypt by about 1540 B.C. where vessels were formed using various complex techniques of moulding and shaping. By Roman times glass was being blown in large quantities to form containers for liquids and for drinking from. Some beautiful pieces were being made in early times with coloured glass, trailed decoration even double-walled pieces containing gold leaf decoration and by the first few centuries B.C. the millefiore style had been invented. 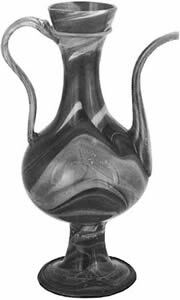 Some of the greatest pieces of Roman glass are the cameo cut examples such as the Portland Vase from the end of the first century B.C. Glass was produced in the Islamic Kingdom from the seventh century where they continued using similar techniques to the Romans including the invention of one or two others such as the use of lustre decoration. Until the Venetians became the worlds leading glass producers in the fifteenth century Islamic glass makers led the world with their colourful and innovative designs. They cut, engraved, gilded and moulded using great skill in the production of intricate and splendid designs. After the Roman Empire had declined the glass produced in Europe was of a fairly mundane bubbly green type generally of plain and functional form. 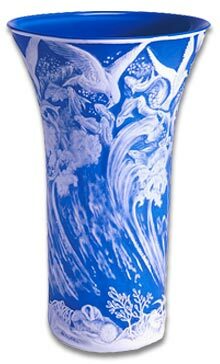 By the eighth century however luxury glass was again being produced and throughout the centuries that followed techniques improved and some more interesting pieces were being made. In the twelfth century stained glass windows were being used for churches and by about 1400 colourless glass was being manufactured again on a large scale. Towards the end of the fifteenth century the Venetians had perfected the production of colourless glass and became the leading glass makers in the world. The manufacture of glass brought great wealth to Venice with exports to all over the world and Venice is still renowned for its magnificent glassware. Glass was being produced all over Europe in Spain, France, Holland, Germany and Britain. Spanish glass having a very much Islamic style and in other countries the Venetian influence can be seen as well as taking on the forms of silver and pottery wares from these respective countries. The British glass industry didn’t really take off until the mid sixteenth century when Venetian glass makers came to England. Before this time glass was produced on a small scale in woodland furnaces where timber would have been used as fuel. In the seventeenth century the next great development was the invention of the coal burning furnace by Sir Robert Mansell allowing much higher temperatures to be achieved. Because of this the main centres for glass production moved to areas where coal was mined such as Newcastle-upon-Tyne and Bristol. At this time the Venetian influence was still prevalent but as the century advanced the style became more individual and less flamboyant with the emphasis being on balance of form and refinement of engraving on colourless glass. With the introduction of lead as a flux in the latter part of the century by George Ravenscroft glass could be produced which had a denser and clearer appearance thus lead crystal was produced. This meant that good quality mirrors and chandeliers could be made as well as wine glasses and consequently Britain manufactured some of the best glassware throughout the eighteenth century. However early Ravenscroft glass had a tendency toward crazing or “crizzling”. Collecting antique glass from British manufacturers and designers can be very lucrative. British Georgian glass is quite highly prized. In Northern Europe the emphasis for glass production was on fine engraving and enamelling. And some of the best engravers in the world came from the Low Countries of Europe. Britians close political ties with Holland in the late seventeenth century meant that fashions and styles were closely linked and it can sometimes be difficult to differentiate between the two as lead glass was also made in Holland. The earliest development in the eighteenth century in Britain was the baluster wineglass. So called because of the architectural nature of the stem, but as time advanced more and more complex designs were being produced with multi sided stems different shaped knops, tears in the stems, i.e. carefully formed bubbles of air, beaded knops with many bubbles and probably as a development of these the air twist and opaque twist glasses. Later in the 18th century faceted stems became popular. Wineglasses in the eighteenth century often had engraved decoration sometimes commemorating causes such as the Jacobite and Williamite glasses. Family crests and armorials were also engraved on glasses. The Beilby family, based in Newcastle, are famous for their enamel decoration on glassware in the second half of the eighteenth century with pieces decorated with armorials a considerable rarity. 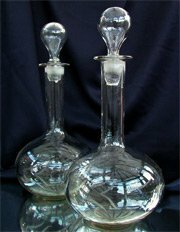 Other glassware produced in the eighteenth century included decanters, tankards, salts, tumblers and a wide range of tableware. Cutting was employed to decorate glass during the eighteenth century at first it of the flat plane type. As the century progressed different cutting techniques developed and by the end of the eighteenth century steam power was being introduced so speeding up the process and allowing more intricate cutting styles to be used. By the early nineteenth century the regency style began to emerge and many of these pieces leave very little areas of glass which are uncut. Glass was produced in Ireland from around 1780 when export taxes were lifted and it is now world famous for its style and quality. During the nineteenth century developments in the glass industry were immense. Many new techniques were being developed France, Germany, Bohemia and America as well as Britain were producing some wonderfully exuberant pieces. Acid etching, fine engraving, magnificent cutting, cameo and rock crystal style engraving were all being used to great acclaim. In Britain the Dudley, Stourbridge and Wordsley areas in the West Midlands are renowned for quality items that were produced and there is still much to learn about the manufacture of glass in these areas. In Manchester the technique of press moulding was being used to mass produce pieces and items could be made with a variety of designs on them including some by great names such as Walter Crane. In the early part of the twentieth there was a continuation of the nineteenth century style and some of the best glass was being made in America and France. In America Louis Comfort Tiffany is particularly famous for his iridescent glassware and for leaded glass lamp shades. 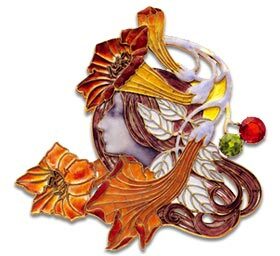 In France René Lalique was making very high quality pressed glass. However there were many more producers of fine decorative glassware throughout Europe at this time. With the First World War there was a decline in quality though some good pieces were still being produced between the wars. After the Second World War there was a marked decline in collectable glass quality … the production of utilitarian designs dominated the glass industry. However, many of these pieces are collected today and they do fit in well with the modern home. Though collecting antique glass is still preferable.